It's been a few weeks since the SCBWI British Isles conference, but I'm still buzzing and inspired after all the useful and interesting workshops and keynote speeches. It wasn't my first conference, I've been to the British Isles Conference before and also attended the Europolitan conference in Paris in 2013. Each conference offers something different, but they all inspire and excite in their own different ways. Before the conference started on Saturday, pre-conference activities had been arranged. This included a Scrawl Crawl through Winchester and a critique group meeting. The critique group was one of my conference highlights as I find being critiqued incredibly helpful for developing my writing and it was interesting to hear different opinions on my story. Later during the conference I had the time and opportunity to talk further with the members of my group about their comments which was very useful. The theme of the conference, Riding the Waves of Change, was brought to life by a multitude of workshops. During the picture book industry panel workshop I attended, Eric Huang of Me Books talked about how they are adapting traditional storybooks for the digital market. As part of the 'How Publishing is Reinventing Itself' panel, publishers also discussed how they are adapting their policies in the light of new technology and digital media. We were introduced to Wattpad, a site where you can download and publish your own stories, and The Story Adventure, an interesting innovation from Hot Key books in which children can add their own ideas to an author's story. There were concerns about how being published on sites like these would affect later chances of publication but the publishers involved said that if it was fantastic writing it shouldn't be a problem. Break times gave us a chance to meet up with old friends, chat with new ones and buy raffle tickets and conference badges. It was lovely to see people who I had met at the Europolitan Conference in Paris and I also met two of the members of my online critique group. Putting faces to names is one of the aspects of a conference that I enjoy, as well as talking to a wide range of people who all come together as a result of their interest in children's books. I cannot emphasise enough how friendly and chatty people were. 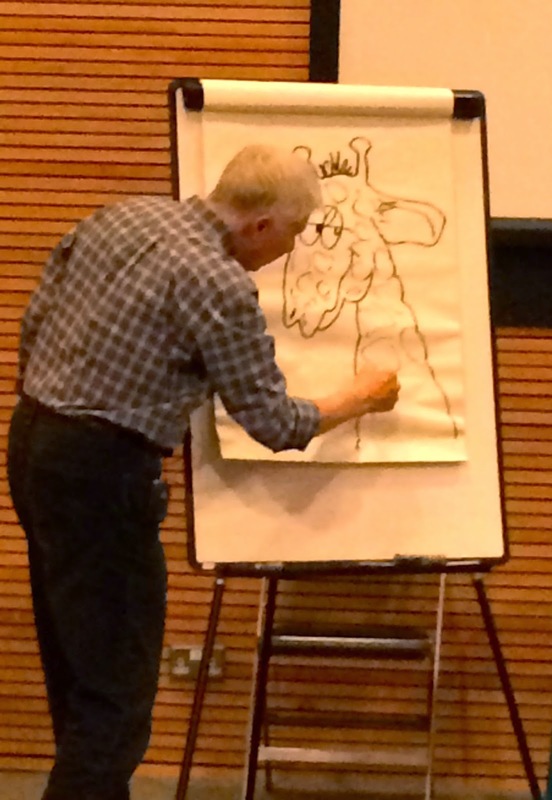 Another highlight of the conference was Nick Butterworth's keynote address, in which he spoke about the inspiration for his books, did some live drawing and explained how his Q Pootle 5 stories had been adapted for children's television. Nick has written many of my favourite stories, the two books of his I have on my blog are some of the most viewed, so it was great to meet the author behind the books. In his smaller, more informal session, Nick answered questions about his work, his inspirations for writing and how he illustrates. It's absolutely fascinating to hear about the work process of the author / illustrator of some of your favourite books. I also took advantage of having my manuscript critiqued by a professional. This one-to-one critique was very helpful and the editor gave me ideas on how to improve my manuscript. I left tired but buzzing with ideas and inspired to sit down and write immediately! Sunday was filled with a large range of workshops to choose from, including illustration workshops, publishing workshops, novel writing workshops and also workshops which were aimed specifically at authors and illustrators who are already published. I went to the picture book intensive with author / illustrator Mike Brownlow and Jude Evans from Little Tiger Press who started the session by sharing their favourite picture books. Then it was our turn to start writing and illustrating and during the day they supported us as we wrote and developed dummy picture books in small groups. This was a useful exercise in terms of listening to how others approach picture book writing and writing a picture book collaboratively. I came away completely inspired by the enthusiasm, the friendliness and the excitement that buzzes through a conference. I'd like to say a huge thank you to all the SCBWI members who organised a fantastic weekend, it was great! SCBWI members from the European regions are now hard at work planning the Europolitan Conference in Amsterdam next year. Like the conference in Paris, this will be on a smaller scale to the British Isles conference but I am sure that it will be no less friendly and no less inspiring. I hope to meet you there! In March of 2013, many of us had the joyful privilege of attending the first SCBWI Europolitan conference in Paris. I had already discovered how incredible the writers and illustrators of the Germany / Austria Region are. I was about to discover how that incredible-ness spread beyond the reaches of my sweet region. What I didn’t realize, was that until this conference, the regions had remained largely inclusive. We just didn’t really know how to connect with the “others” over there across the border. I mean, who KNOWS what those French region people are up to?! Or can you imagine the Swiss? Or Belgian? The Paris Europolitan conference broke down those barriers… and I believe I can say for all of us, revealed what awesome resources, friendships, and possibility lay just around the corner from us. I even left with a new critique group, spread out over three countries. This past October 25, many of us met up again for the Chart Your Course to Success Workshop, hosted by the SCBWI Swiss Region, in the breath-taking Lausanne. What does this have to do with the Europolitan conference? I believe one piece of the success of this event lay in the foundations of March 2013. The other pieces were, of course, Elisabeth Norton, the SCBWI Switzerland RA, and the two amazing guest speakers, Polly Nolan, literary agent with Greenhouse Literary Agency and Jude Evans, Publisher of Little Tiger Press. And the piece not least of all, was the open invitation to members of other SCBWI regions. Because Europol-Paris taught us that the authors and illustrators in the other regions aren’t so scary :) Actually, they’re kind of awesome. I know. I’ve attended a writer’s retreat with the Belgium region and I can’t WAIT for the next one. And you know, SCBWI Germany/Austria puts on some pretty darn great events too. I personally made a couple new friends, none of whom are members of the Germany / Austria region. (I would have been just as happy to make a new friend in our region.. but there wasn’t anyone there from our region who I didn’t know yet :). Elisabeth put together a great workshop, with a track for picture book writers and illustrators and a track for middle grade and young adult writers. Then Ms. Evans and Ms. Nolan generously offered their entire day to us. (They even ate lunch with us. I mean, you want to get to know someone? Let them watch you eat. Or you watch them eat.) They answered questions, offered critiques after the workshop, and shared their plethora of knowledge. They were fabulous. The whole thing was fabulous. One thing that struck me (and made me even more glad that I went) is that Little Tiger Press is currently closed to submissions, because they get so many it’s overwhelming. Now they are focussing their energies on workshops and conferences… hoping to find the story they’re looking for among the people proving their dedication to the industry… by paying the money, showing up, and never giving up on learning. That’s us, folks! We are dedicated, aren’t we? And we spur each other on. I have had a ROUGH and wild year, beginning with last June. All the turbulence of life and parenting and traveling and fund raising left me weary, uninspired, and out of touch with my writing for a few months. This workshop kicked me back into gear. The new friends, the “old” friends, the reminders about why we care so much about children and literature… it was what I needed to get going again. And really, isn’t it staying connected to our writer / illustrator selves sometimes what keeps us sane through the rough waters of life? I know as soon as I start writing again… I start breathing again. The NEXT Europolitan Conference is coming up.... in Amsterdam! Mark your calendar now for April 3 - April 5, 2015. You can check the lineup here… It looks amazing. And have I mentioned how cool the SCBWI Netherlands Region is? I’m not surprised anymore when I join another region and find out how super lovely they all are too. Don’t want to miss anymore events? Join the Facebook pages of our neighboring regions to keep up-to-date an events they are hosting. And of course, we often post events on our own Facebook page, SCBWI Germany / Austria.